Surely there isn't anything in this world harder than going back to work after having a few days off for Thanksgiving. I hope everyone had a great time. Monday's are usually always tough, and I would imagine the first thing you're going to do today is make yourself a cup of coffee...or...go to Starbucks. The spot below, titled Snowflake, is for Starbucks. What you have is people around Central Park in NYC flying kites with snowflakes attached to the ends. The idea behind this spot was to showcase some of Starbucks' holiday favorites as the holiday season approaches. 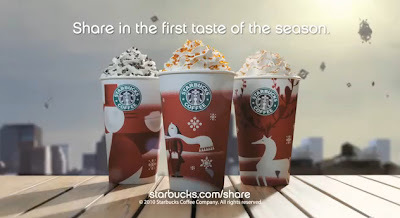 I'm a fan of the Christmas blend, what about you? Anyways, go get yourself a cup of coffee and enjoy the commercial below. Enjoy! Thanks for the comment Lonnie...the song is pretty good too!